Voluntary benefits are increasingly essential to employee peace of mind and financial wellbeing, but many employees still struggle to understand how their supplemental plans work. This confusion results in coverage gaps and limited job satisfaction – but a tailored enrollment and benefits experience can help. Empyrean’s latest At-A-Glance Guide explores how you can leverage your benefits administration platform to strategically improve employees’ voluntary benefits awareness and adoption. Here are just a few key insights from the guide. To reap the most success with voluntary, your benefits enrollment and administration platform must be optimized to logically and holistically present voluntary plans to your employees. Your technology partner must be capable of supporting you and your unique workforce to achieve the outcomes your business requires. Voluntary plans are a smart addition to any benefits offering and are growing in popularity with employers. But with employees, they aren’t instantly recognizable as “must-haves.” Employees need the right tools and resources to clearly recognize the ways voluntary products complement their core benefit elections and support their needs. Employees pay the most attention to their benefits during Annual Enrollment, making this the best time to drive attention to your benefits. But participants need more than lunch-and-learns, reminder emails, and plan brochures to gain true benefits confidence. You must provide employees with a supportive and educational enrollment experience that builds on their knowledge as they go through the process. Your enrollment process should be mindfully designed to encourage a holistic view of benefits that leads to smarter choices. Employees need help gaining the right perspective when it comes to weighing their needs and choices, especially when electing additional coverage. Look for a benefits administration partner with client-adaptive technology to tailor communications and enrollment to your benefit options, employee populations, and strategy. Without client-adaptive technology, it can be costly and tedious to customize the enrollment process to fit your unique benefits and workforce’s behavior. Not all benefits administration platforms are architected to allow for fast changes, personalization, and optimization. Embedded content and resources serve as invaluable guides for employees navigating their benefit choices, and are a reference for those considering if a voluntary plan is right for them. Optimizing messaging within the enrollment experience using customizable, benefit-specific text and educational videos provides employees with easy access to trusted information and answers when and where they need it most. The enrollment experience must present benefits in a logical and informative manner that helps employees create connections between your various offerings. A logically designed enrollment flow, supported by relevant in-page content and resources, provides your employees with a shopping experience much like that of their favorite online store (think of the “You may also be interested in…” sections found on most modern online shopping websites). In fact, 44% of employees want benefits shopping to feel more like browsing Amazon.com.1 Selecting a benefits administration partner that can deliver a cohesive, e-commerce-inspired enrollment – regardless of the carriers or plans you choose to offer – will ensure your employees have the familiar and positive shopping environment they need to comfortably browse their options and make well-fitting benefit decisions. Tailoring and optimizing the enrollment experience has shown proven success with voluntary plans: One Empyrean client recently achieved a 30% adoption rate for voluntary plans* among eligible employees following strategic optimization of their enrollment experience on the Empyrean Platform – a more than 757% improvement over their previous voluntary plan adoption rate. As voluntary benefits become an increasingly crucial element of employers’ benefits strategies, the right technology can alleviate the burdens associated with these plans. Participants struggle to understand their benefits, so employers must give them the tools and resources to break through the clutter and become more confident consumers. An intelligently designed enrollment and administration platform will offer the smart tools, intuitive processes, and flexible experiences your employees really need. This approach is proven: Employers that optimize enrollment experience to fit their offering and workforce measurably improve voluntary plan participation – and lower their costs and risks in the process. 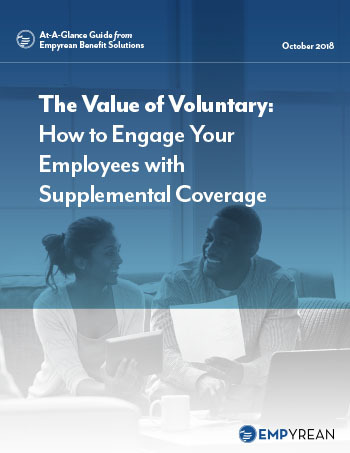 For more on how you can improve your employees’ voluntary benefits participation, download Empyrean’s new At-A-Glance Guide today. As you read, we’d love to get your thoughts. Feel free to contact us with questions or comments at info@goempyrean.com. “2018 Aflac WorkForces Report: Employee Overview.” Aflac, Inc. Columbus, GA. July 2018.